Looking for the kind of pancakes a right-wing conservative columnist would blame for your lack of property portfolio at the tender age of 25? Look no further! I’ve handcrafted a heap worthy of the hippest hipster cafe D7 has to offer. *Allergen advice: Suitable for vegans and coeliacs but may contain notions. 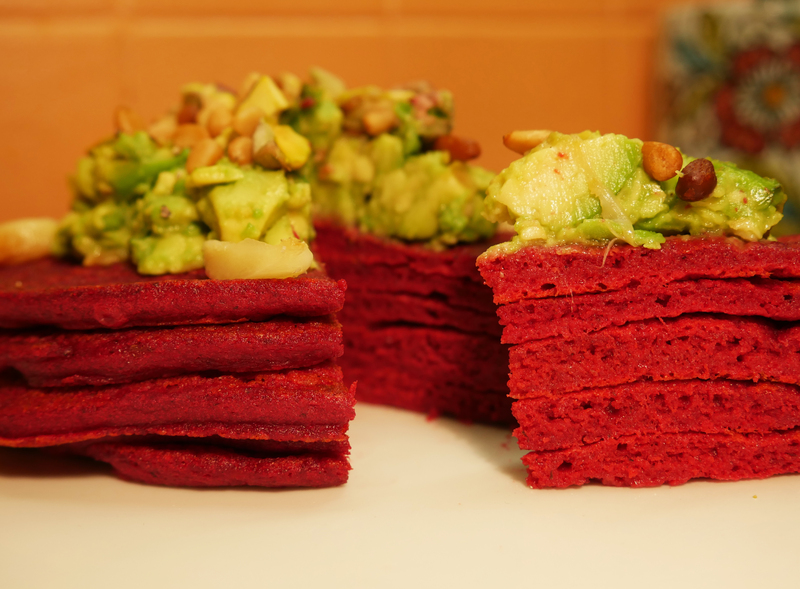 Pondering the close proximity of Pancake Tuesday and Valentine’s Day I decided some festive pink pancakes were in order. I’m more of a savage for savoury stuff than sweet so this bizarre batch did things (great things) to my palette. While it’s wholly acceptable to have chocolate laden pancakes at every o’clock today, give these a go if you fancy something of the BEETen track… Jaysus. Shtick your oven on gas mark 5 (190°C for all you electric and fan ov-huns). 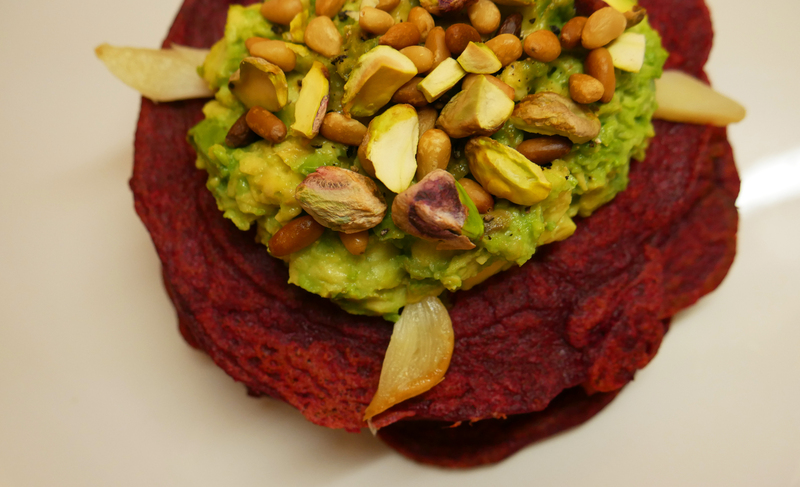 Leave the skin on your beetroot, wash it and cut it into big chunky wedges. Place these in a roasting tin or tray and rub olive oil on them. Leave roasting for 40 minutes. Toppings: These are optional but HIGHLY recommended… Now that you’ve made the right decision, let us proceed. You can oil up the garlic and pop it in with the beetroot. I only used one clove of garlic but roasted the whole bulb because roasted garlic is the eight wonder of the world. Put the pine nuts on a baking tray with no oil. The pistachios I used for toppings were already roasted and salted (Tesco has a whopper bag that’s great value) but if yours aren’t put them in to roast now too. Roasting nuts and seeds really brings out their flavours! Leave the nuts and garlic in the oven for about 10 minutes, keeping an eye on the nuts to make sure they don’t burn. Sift your flour, xantham powder and salt into jug. When your beetroots are roasted let them cool. Then chop them up and blitz them in a blender with the milk. Pour this pink juice into the jug with the flour and whisk them all together until you’ve a smooth mixture. It shouldn’t be as runny as traditional pancake mix nor as stiff as humus. If you need to correct your mix add a little bit of milk or flour depending on whether it’s too solid or runny respectively. Pop a non-stick pan on a medium heat and put some oil in it. When the pan is hot spoon some of the mixture on to it and spread it into a circle. Only make small pancakes, about the size of your hand with all your fingers spread out, as the consistency is slightly different to traditional pancakes. After about 30 seconds, slide your spatula under the pancake separating it from the pan, I find silicone spatulas the best for this. Flip it! Repeat steps 6-8 until the mix is gone. It should make about 6. 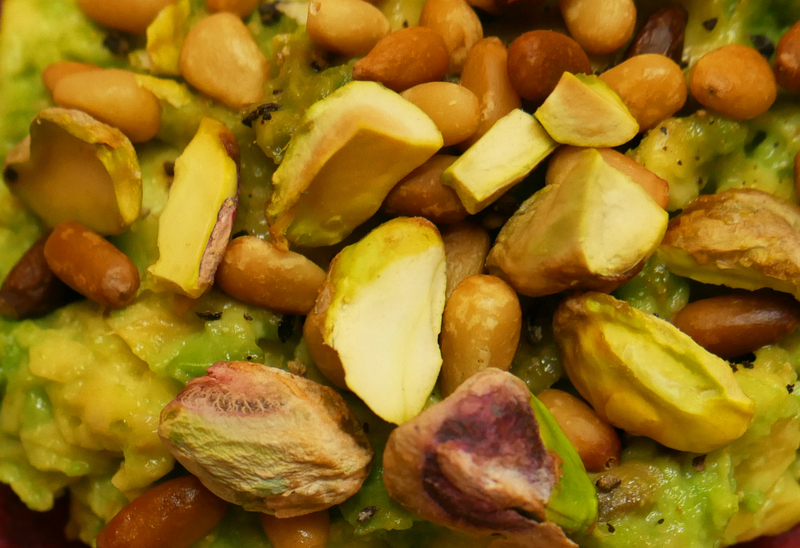 Serve up your stack, mashing the avocado on top then garnishing with your gorgeous roast nuts and garlic. 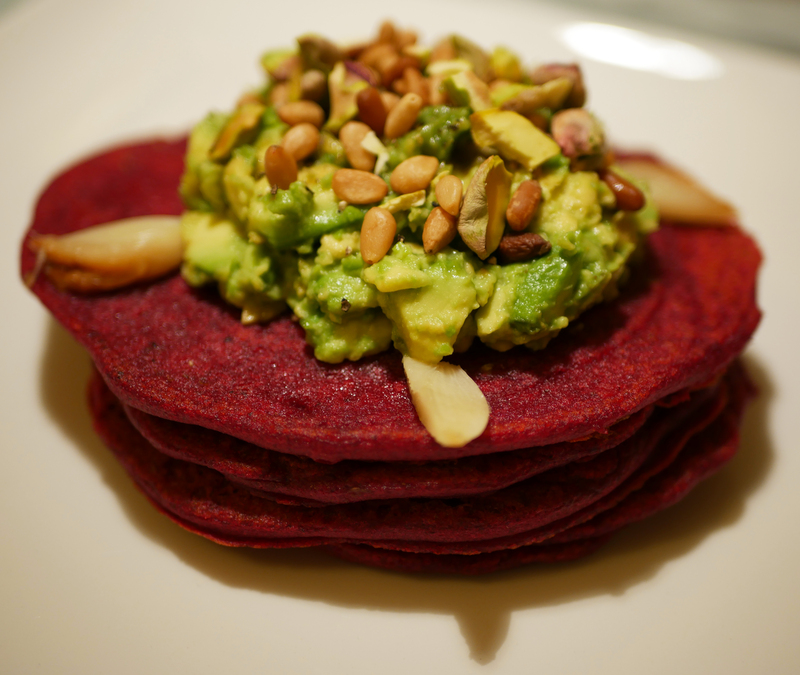 Basking in the smugness the roast beetroot pancakes served up when your foodie friends asked for the recipe? I’d love to hear what you thought of these, let me know on Insta.